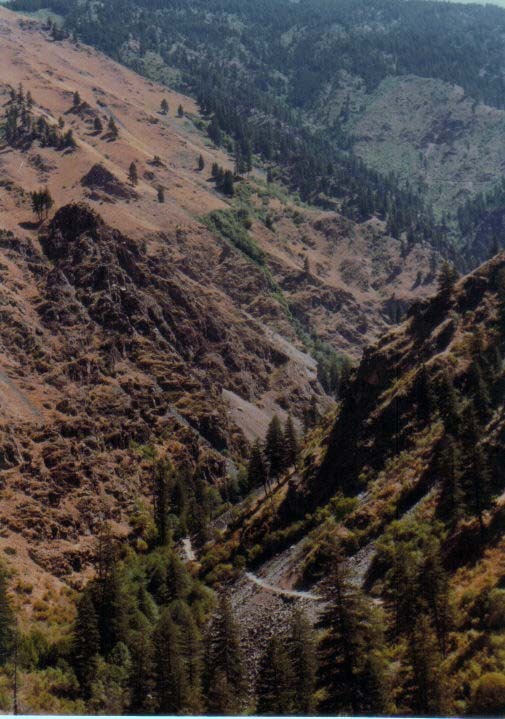 Mining the Red Ledge, an Oral History of a Life in Idaho’s Seven Devils Mountains. Hugh Addington, born November 24, 1894, was the mine mechanic at the Red Ledge mine on the Eagle Bar in Hell’s Canyon, Idaho. The Red Ledge and associated mines, Landore, Peacock, South Peacock, and the Blue Jacket, operated for about two years in 1926 and 1927. 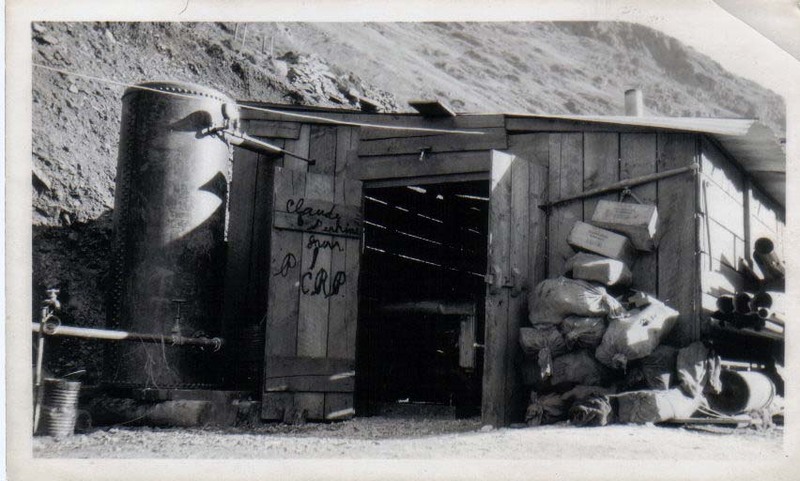 Hugh was one of the first men into the mining area, setting up camp and the machinery. He was one of the last to leave, closing up the operation. A map is at the end of this post. 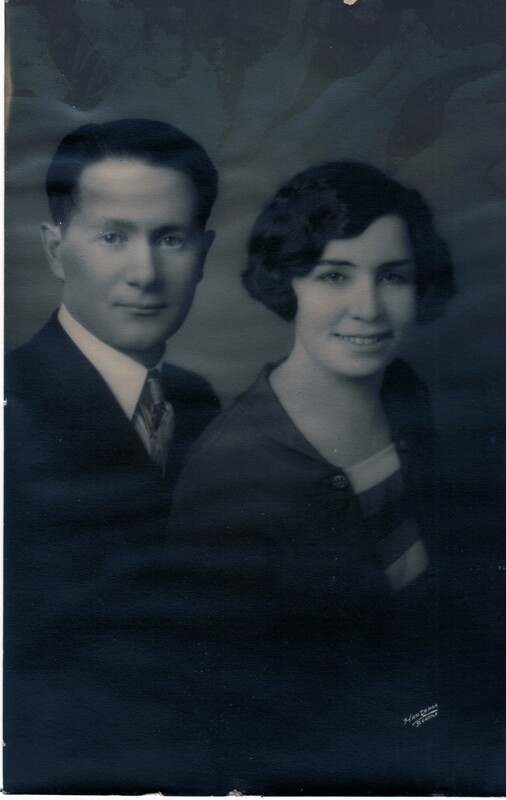 Hugh and Olive Addington in a wedding photo, 1916. 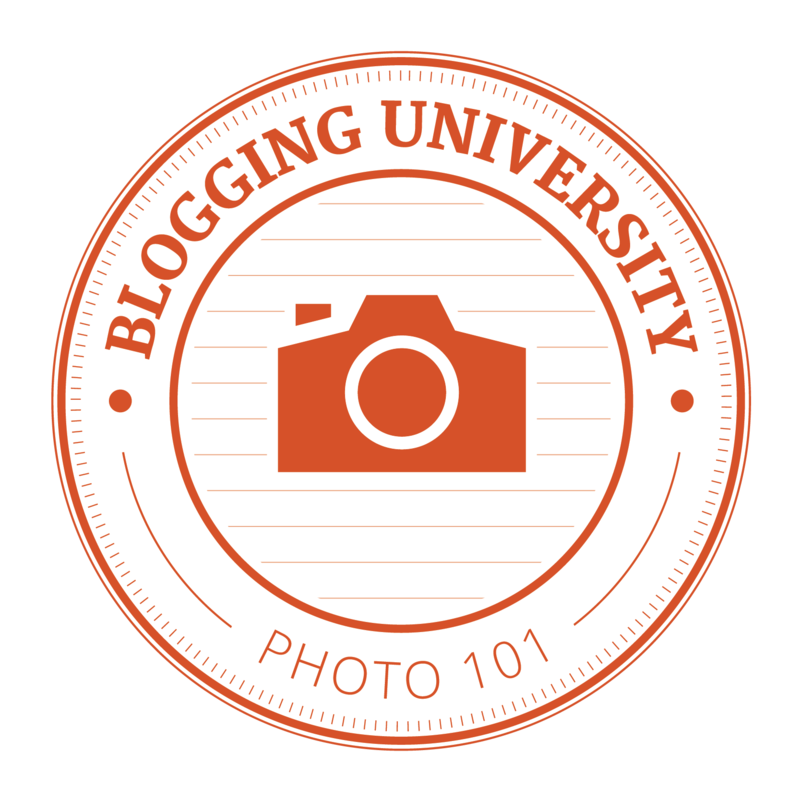 He was married to Mary Olive Emery Addington for more than sixty-five years. Olive coordinated education and taught at the only school the Hell’s Canyon had then. The one-room-school house, along with the mining camp and other buildings, are now under water backed up by the Hell’s Canyon Dam. Olive Addington’s school at Eagle Bar. Here is Hugh’s account of the mining operation as told to me, his granddaughter, in November, 1978. 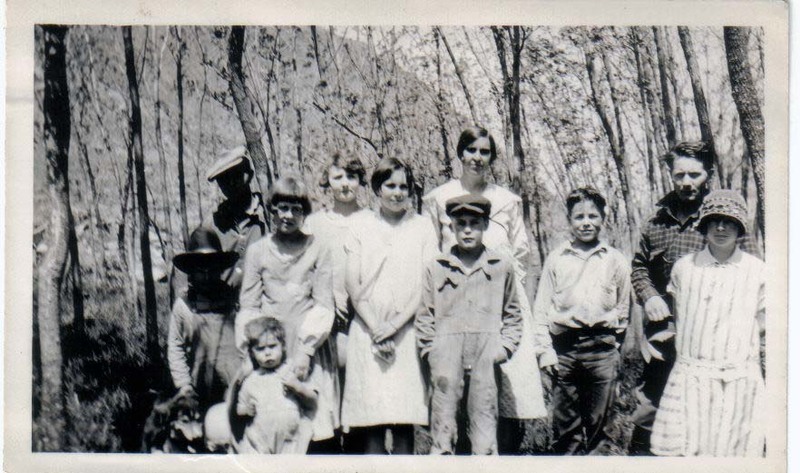 Tape recordings of this and other accounts of the mine and early life in Idaho are archived at the Adams County Library in Council, Idaho. 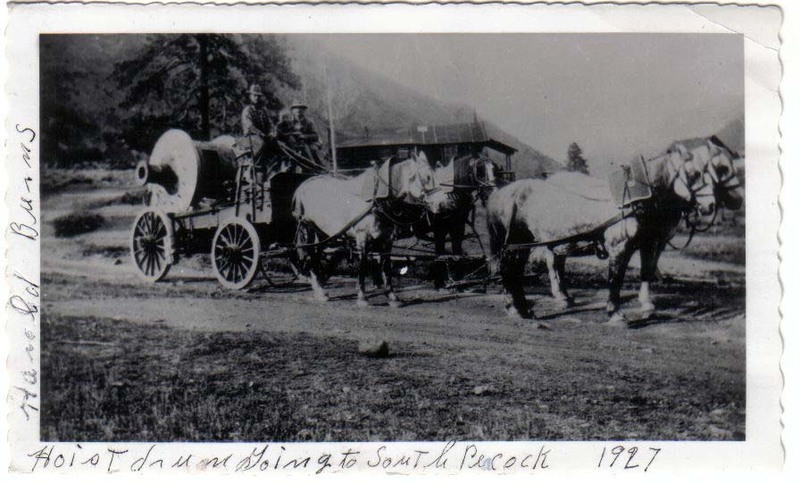 They skidded all their groceries and supplies to Snowline, a dry camp, by way of six horses pulling wagons on skids. “See, there was no road in there at all. Morrison Knudson was buildin’ a road along the edge of the river. It was a regular Klondike deal. We lived in tents for dog-goned near a year before we got any building set up and…heh…fifty men…and I’ll tell you, when you house up fifty men, and they can’t get away from each other, you better be careful, you could get a fight any time you wanted one. Oh! They get cranky! Holy Jesus, they get cranky and ornery. The steep narrow road up Deep Creek to the mnes. Hugh: “They didn’t take it as a joke! I’ll tell you they didn’t! I was sittin’ right by the superintendent eatin’ breakfast. We always had hot cakes for breakfast and, of course, I poured a whole lot of it on my plate. I heard somebody down at the other end of the table…they was three tables, long tables…say, ‘It’s oil!’. Well, I took a bite and the minute I took it I knew it was oil and I spit it out! I was sittin’ there with the MP and he took a mouthful of it and he swallowed his! And then he threw down his knife and fork and out of the tent he went. I thought, ‘Damn you. If you can eat that, I can too!’ and I tried another mouthful but I couldn’t go it. I spit her out. Finally they was just about to hang the superintendent. [ Hugh broke up laughing here.] There was an awful rumpus. Jess Ward, the mine foreman, he come to his senses and he said, ‘I made that mistake. It was a can of oil that I was supposed to have got and it got in, tangled up, in the groceries.’ Jess got the men settled down. I’ll tell you, they was about to hang the superintendent! Heh…heh…heh. “We started to tunnel into that tunnel there. Instead of startin’ that tunnel in the rock they started it into the dirt and we went a hundred and seventy-five feet into that hill. It was an eight-foot square tunnel and I’ll tell you, that dirt was heavy, before they hit solid rock. But when they hit solid rock, it was just a wall, just like a cliff. They came down in the night and got me out of bed to start the compressor and they started drillin’. Well, we had good machinery, good drills. 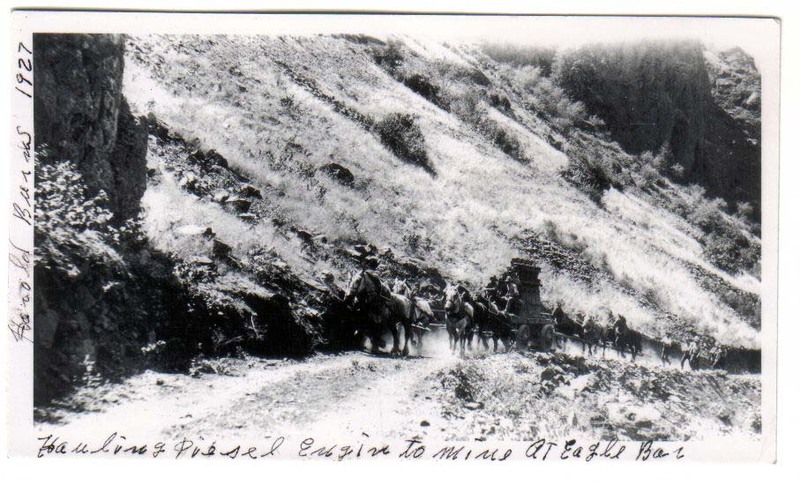 We had English Sawl Rand water liners for drills and they was some good hard rock miners. They set those up and put up three drills on a bar. Now, a bar is a thing that reaches across a tunnel and it’s kinda like a screw jack and you screw it into the wall good and tight and hold it. Then you set your drill on top of that. Then they run air and there’s water that goes right down through the center of ’em and down through the drill. The drill is hollow, right down to where the bit is because you’re not allowed to run a dry drill through a tunnel because you get that rock dust in your lungs. It doesn’t make any dust. It comes out and it’s all kind of a mud. They set three of those on a bar and started drillin’. That rock was hard. I tell you, that rock was hard, that old diorite. The fire would just fly when they started drillin’. They was drillin’ twenty-four holes in the face of that thing, in that tunnel. They couldn’t pull it at first. They was pullin’ around. Now, pullin’ around is blastin’ it out. They was drillin’ five feet holes, five and six feet deep. You know, them electric caps are in what they call ‘lays’. One bunch’ll shoot. Then another bunch’ll shoot. Then another bunch’ll shoot. They was a shootin’ it with electric caps. So they drove, drilled, this wedge in there like this, in a ‘V’. Now, those are ‘best holes’; the first or the middle holes are ‘best holes’. And, then, they drilled their uppers and then they drilled their lifters. They’d shoot the best holes out first. They’d shoot that ‘V’ out and then down would come the uppers, would blast, and then the lower ones would blast. There’d be a big pile of muck there then, and they’d shovel it out. That was the only way they could pull that ground, it was so hard to pull. 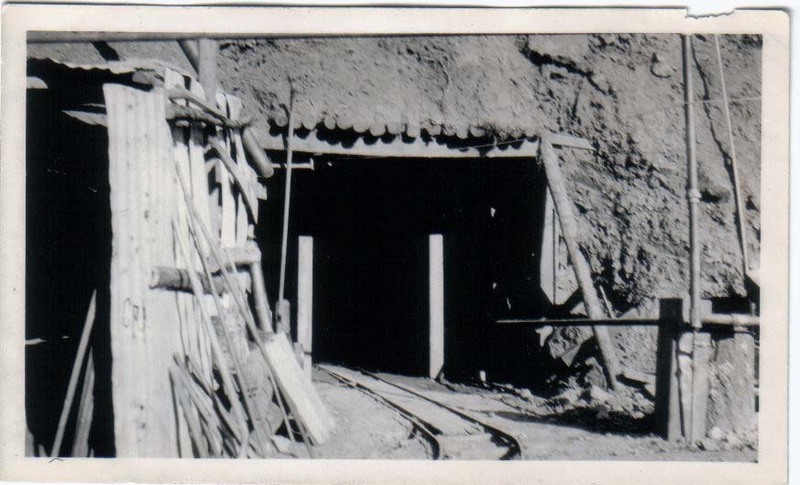 It was an eight-foot-square tunnel. We were really goin’ into that mountain. We got in there seven hundred feet when she shut down. They bought a lot of street car rail in Boise and hauled it down there for rail. We had forty-pound steel and six by sixes for ties. They had an electric locomotive and eight three-ton ore cars that were on Tempton bearings and everything was a workin’ just wonderful. They had two Butler muckin’ machines. Now, these muckin’ machines, they’d run one in, in front of the train, and then they would wedge it to the track so as to hold it. That muckin’ machine would reach out nine feet and then it would double right up and it would spin right around, it run by air, and dumped it into the car behind it. It was awful fast. The man that run it, he strapped himself to it to keep from getting thrown off. 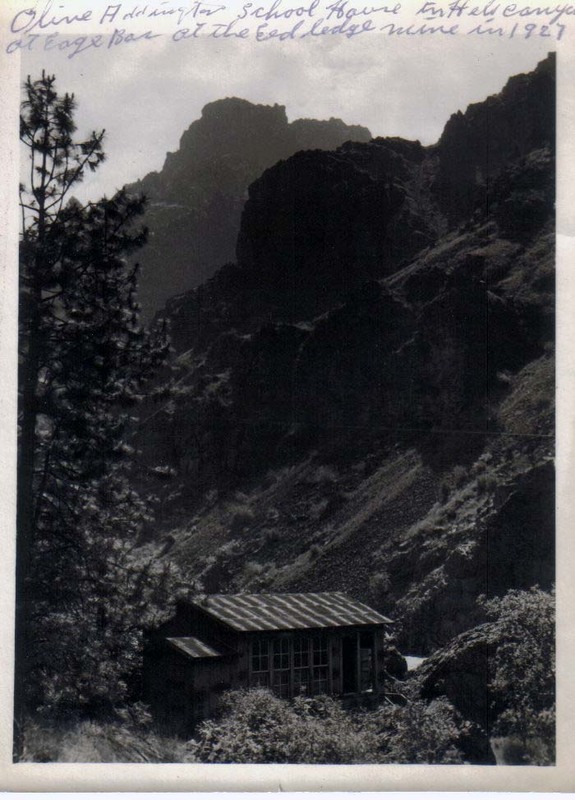 The compressor house from Deep Creek 1978 near the Hells Canyon highway. We had two of those and two machines on a bar and two jack-hammers runnin’ outside and I could hold a hundred pounds of air with that compressor. We had a wonderful compressor. We had a two stage compressor that had high and low cylinders, low compression on one side and high on the other. A big flywheel was in between. It weighed seven tons, that compressor, and the engine weighed nine tons that run it, a diesel engine. The fly-wheel that run it weighed a ton. The belt pulley on the engine was four feet in diameter and the one on the compressor I think was seven and it was an eighteen-inch leather belt. Boy, I’ll tell you, they had a fine bunch of machinery. 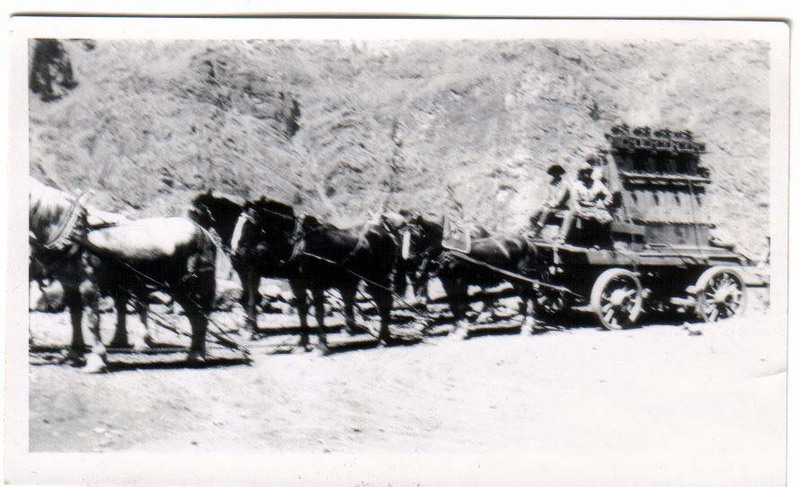 Harold Burns with Hugh Addington hauling diesel engine to the Eagle Bar mine 1926. Horses behind are pushing on a pole. They brought it there on a loggin’ truck with six horses. When they took it up the mountain they had six horses in front [pulling] and four horses behind pushin’. They had them hooked up to a pole pushin’ on the back. They were pullin’ but we called it pushin’ because they were behind, shovin’. 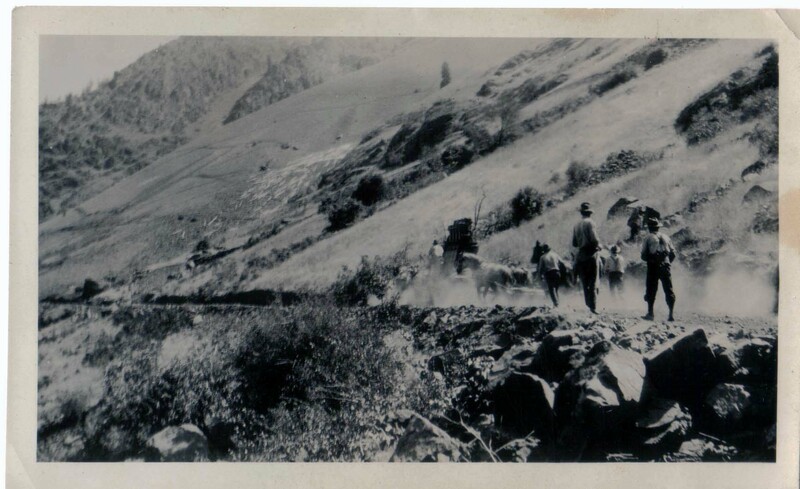 Men walked behind to drive the horses and keep them on the narrow road. A hot and dusty job. Rest stop while hauling diesel engine. That tunnel was to be nine thousand feet long when it got under Deep Creek and Deep Creek was to be nine thousand feet above it. They were goin’ to bring that water down through a shaft, bring it out and make their own electricity. Kennedy, the engineer, told me, ‘We’ll never get back under Deep Creek. That ledge is on a dip. We’ll get ore in about four thousand feet and we’ll have all the ore to run for years and years’. They had surveyed out where the mill was gonna be just about a week before they shut down. 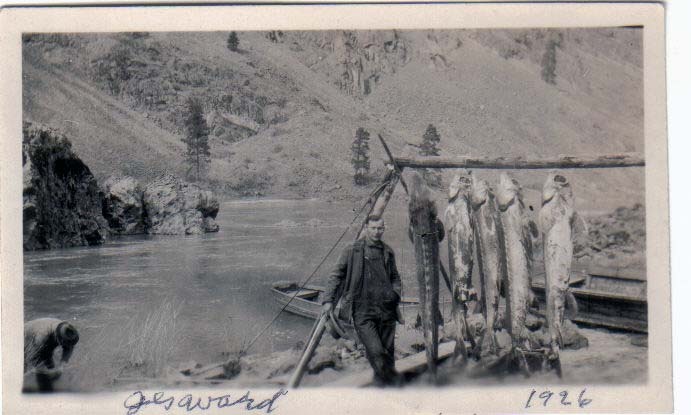 Mining foreman Jes Ward with some of the sturgeon mined by the night crew. 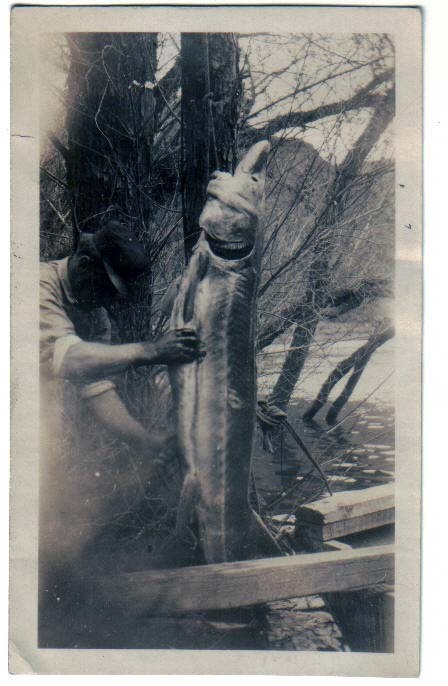 Cleaning 19 sturgeon caught by the night crew at Eagle Bar mine. 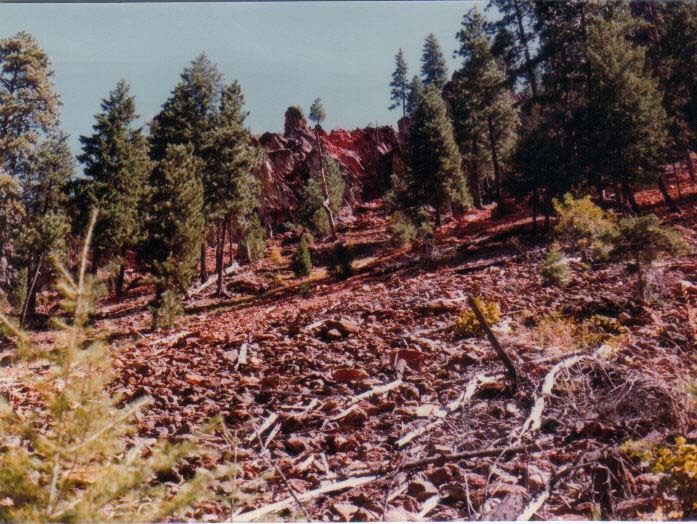 Red Ledge, South Peacock, and other mines are in white, private lands. 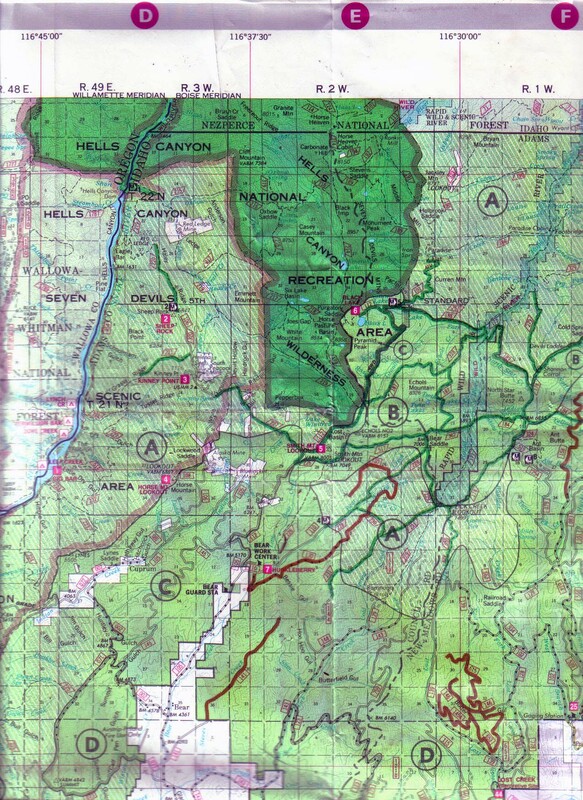 Red Ledge and South Peacock mines are west of the Hells Canyon National Recreation Area (dark green) and east of the Snake River. 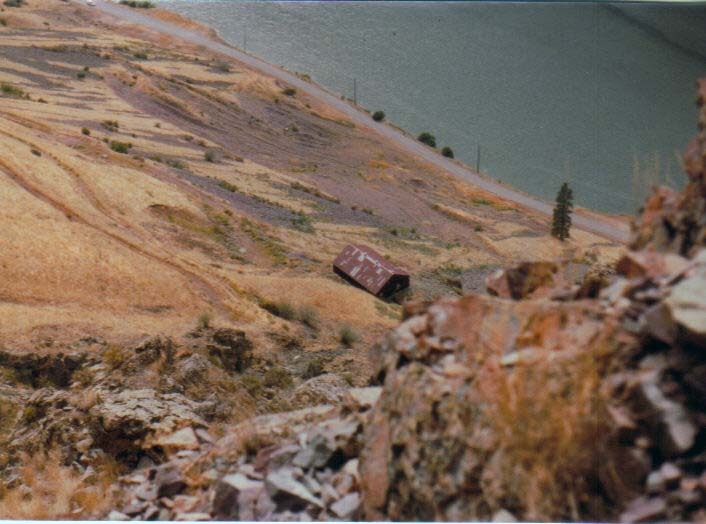 Eagle Bar and the Red Ledge (horizontal marker, the triangle) are closer to the Snake River. Blue Jacket mine is southwest of the Hells Canyon National Recreation Area. 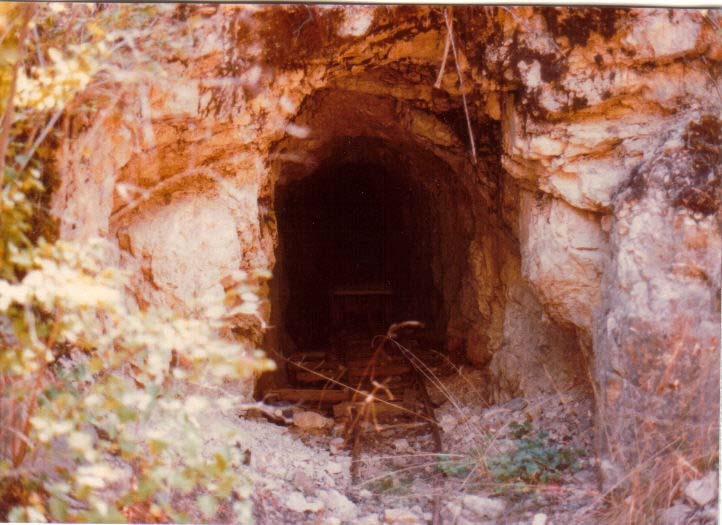 The 1978 photos were taken when I hiked down Deep Creek with my dad, Bruce Addington, to visit the Red Ledge mine. We actually started our Deep Creek hike from the Peacock mine. Deep Creek runs from Smith Mt. to the west.